Thanks for taking the time to come to our website. We’d like you to learn all about the food and drinks we serve, the services we offer, and our beautiful location. Once you see all of this, you’ll be ready to visit us in real life. The Bluffs on Black Lake is easy to find. We are directly across from the Black Mountain Recreation Area, and we are a short drive from Rogers City, Cheboygan, Onaway and Indian River. We are at the trailhead for all Northeast Michigan trails, and we welcome visitors all year round including mountain bikers, hikers, and motorcyclists in the warmer weather, and snowmobilers and cross country skiers when it turns cold. In fact, the cross country ski trail groomer comes directly to the front door of our restaurant. Boaters can dock on our northeast shore, and we will be glad to pick you up in our golf cart and bring you directly to the restaurant. 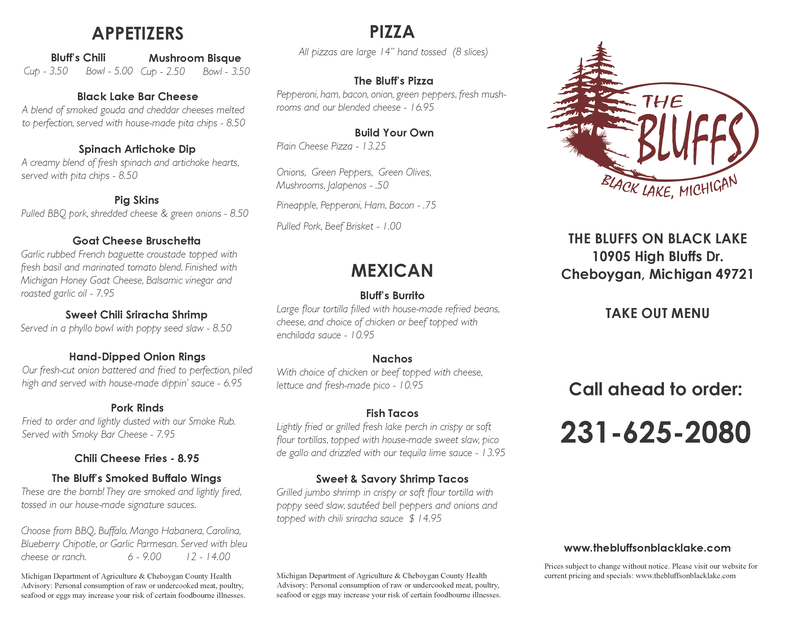 With close to forty years of combined experience, our chefs deliver a full menu of delicious and sumptuous food, including burgers that have been described as the “the best burgers in Northern Michigan.” In addition, we feature Michigan-made craft beers along with standard selections. Check out our menu.